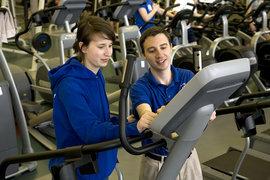 Q: What types of fitness options are available on campus? 1/14/2008Share this story on Facebook! Take a virtual tour of the Fitness Center! A: At IC it’s easy to stay fit even during the bitter winter months. The Fitness Center, which is free for students and open seven days a week, includes all of the standard aerobic and strength-training machines, plus a basketball gym, inline skating gym, and climbing wall. Personal trainers are also available for extra motivation and guidance. There are plenty of group fitness options too, including yoga, Pilates, kickboxing, and funk dance classes led by IC students. Interested in swimming laps? Head over to the Hill Center, which houses the indoor pool.